A great space saver at the bench or machine with enough capacity and work surface to check small and medium size parts. Adjustable arm is locked by large knob. Base is stress-relieved cast iron. Has lifting lever retraction. Same as 135, but with granite base which has greater resistance to wear, lower thermal coefficient and freedom from rust and corrosion. Flatness certified to within .000050”. 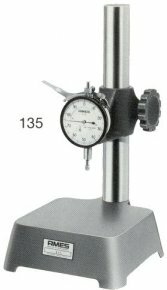 Same as model 135 except that indicator is equipped with dead weight and contact point to meet a particular ASTM or TAPPI specification for checking compressible materials. When ordering, specify weight load, contact and shape. If granite base is desired, specify Model 135GW. Working Surface 5 X 5"
Total Range Up to 1"
Contacts : - Any size or shape having 4-48 thread. For special contacts, consult Ames engineering. Other : - Special size and shape platens and holding fixtures. Contacts mounted on reference surface. Longer column – up to 18” (135 only).